Looking for a truly unique Collection of fine lighting fixtures? Choose a product from our catalog line and view our unparalleled selection of Chandeliers and Sconces, in Crystal, Bronze, or Antique. If you're hoping to add an elegant lighting Accessory to your decor, browse our extensive assortment of Lanterns, Bell Jars. Please do explore our downloadable catalog and we are always available online or by e-mail: GeminiCutGlass@nj.rr.com. Our fixtures can be tailored to be unique for you or your customer. Click Here to Download the Catalog. Below is a sampling of what you'll find within the catalog. 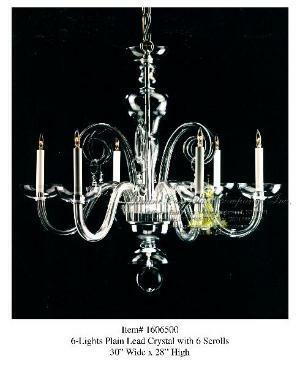 Waterford Style Crystal Chandelier. We have the ability to make any custom modifications by request. With many years of experience, we can make any basket or garland design in various types of crystals. 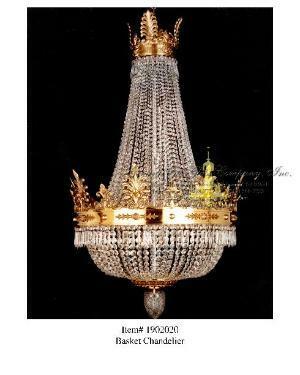 From time to time, we acquire fine Antique lighting fixtures that we offer for sale. 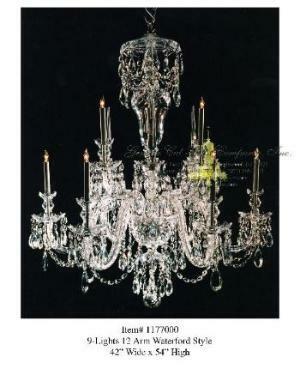 These fixtures run the gamut from small, elegant fixtures, to top-of-the-line, large chandeliers. The Antique fixtures in warehouse are constantly changing, so be sure to contact us at GeminiCutGlass@nj.rr.com to inquire.